The band were ahead of their time, wonderfully weaving together music, poetry and satirical humour. Liverpool Scene were absolutely brilliant live and were one of the busiest bands in the country and a huge favourite of college audiences. The band broke up in 1970. 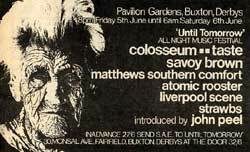 The Liverpool Scene re-formed around 1974 with Dave Richards on bass and Mike Kellie on drums and played a short tour of the UK. BRYAN (BRIAN) DODSON, (replaced by) PETE CLARK, (and later) FRANK GARRETT. Soon, on the back of a 1967 poetry anthology entitled The Liverpool Scene, Adrian Henri, Roger McGough and Andy, along with jazz saxophonist Mike Evans and songwriter/guitarist Mike Hart, were taking bookings as ‘The Liverpool Scene Poets’. Roger had to drop out of the poetry gigs (The Scaffold), leaving Andy to suggest to the charismatic Adrian Henri that all they needed was a bassist and drummer to become a bona fide band. Percy Jones and Bryan Dodson (later replaced by Pete Clarke) filled those roles respectively and The Liverpool Scene was born. 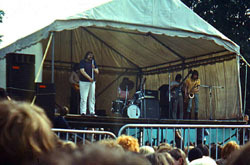 An album for CBS had already been recorded, prior to the band’s formation, called The Incredible New Liverpool Scene – basically Andy accompanying Adrian Henri and Roger McGough, recorded over a couple of hours in Denmark Street, London. BBC Radio’s champion of ’the underground’ John Peel took a shine to it and regularly booked the now fully-fledged band (or, as a duo, Roberts & Henri) for his show and for his own live engagements. 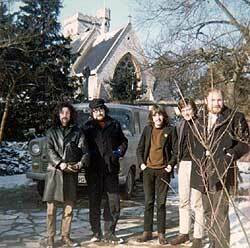 He also nominally produced their first full-band album, Amazing Adventures Of… (RCA, 1968), in a recording deal secured by their new manager Sandy Roberton – a key figure in the careers of many now legendary acts at the progressive ends of folk and rock music of the time. The American experience would nevertheless inspire the band’s best work – the lengthy ‘Made In USA’ suite, one side of their last LP proper, St Adrian Co, Broadway And 3rd (1970).